It has a black magnetic stripe at the bottom, three rounded corners, and one "cut off" corner. The back of the card has what I call a physical expiration date which is usually set pretty far in the future. 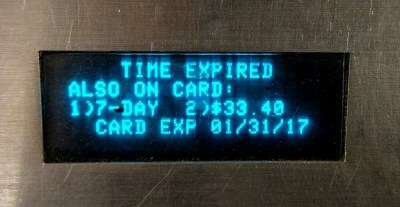 This physical expiration date is fixed and indicates the time when the card becomes unusable and must be exchanged for another one at a token booth. This physical expiration date has nothing to do with the value and time on the card, so don't confuse this date with the expiration of an Unlimited Ride window (which I will explain that later). This physical expiration date is merely there to take old cards out of rotation. 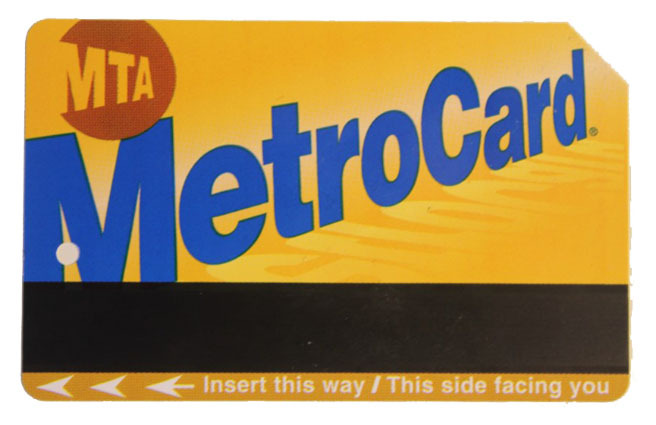 A MetroCard can operate in two modes: Regular and Unlimited Ride. Physically, the card looks identical regardless of which mode it is currently in, so you can't tell the difference unless you swipe it at a card reader. There also exists an all-white Single-Ride ticket for $3 but it is not economical to buy it. 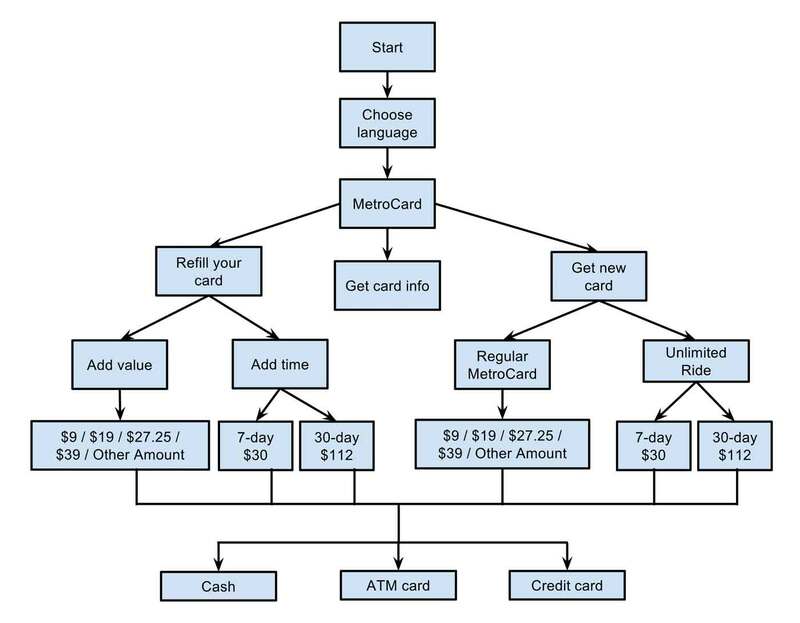 Regardless of the type of MetroCard, it costs $1 just to buy the card. 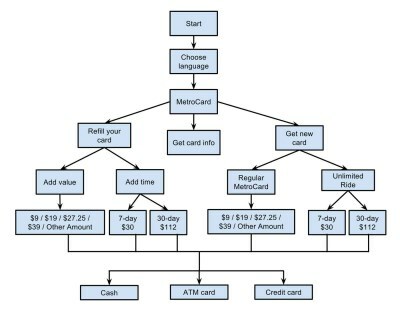 The regular MetroCard (also known as a Pay-Per-Ride card) carries a real dollar value that decreases every time you take the subway (hence "pay per ride"). You can keep on adding value to the card whenever your balance runs low. The fee to buy the card itself is $1 and is not refundable. This $1 cannot be used to pay for rides (and is therefore not reflected in the balance). 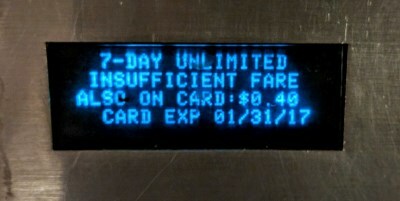 In this card mode, the cost of riding the subway is $2.75 per ride (regardless of the destination or length of the ride). Pay-Per-Ride cards can be shared by up to four people. To share a card, swipe the card for each person individually: swipe the MetroCard, let the first person enter, swipe it again to let the next person enter, and so on. You can also use this Pay-Per-Ride card to pay for some other public transportation in New York City, such as the buses, the AirTrain to/from the JFK airport or the PATH commuter trains to New Jersey. You can combine the values of multiple Pay-Per-Ride cards by going to the information booth and asking the attendant to combine them for you. When you do so, only the current values are accumulated; the $1 fee for each card is not taken into account. Sorry, there aren't any weekend passes or single-day passes. If you think you are going to make more than 12 individual trips (a very likely scenario for tourists staying more than two days), buying a 7-Day Unlimited Ride card will be cheaper than paying 12 times. The time window does not activate until you swipe the card for the very first time at a turnstile to enter the system. For instance, you can buy the card on January 17, activate it on April 1, and it will expire at midnight between April 7 and April 8. Unlimited cards always expire exactly at midnight on the 7th or 30th day, regardless of the time you activated the card on the first day. For instance, if you activate a 7-Day Unlimited Ride card on Monday morning, it will expire Sunday night at midnight. If you activate the card Monday evening at 11:30pm, it still expires Sunday night at midnight. As a result, you effectively get to use it only for 6 days and 30 minutes. In that case, you are better off paying for a single ride using the Pay-Per-Ride card and then activating the Unlimited Ride card the next morning. Unlimited Ride cards cannot be shared by two people. 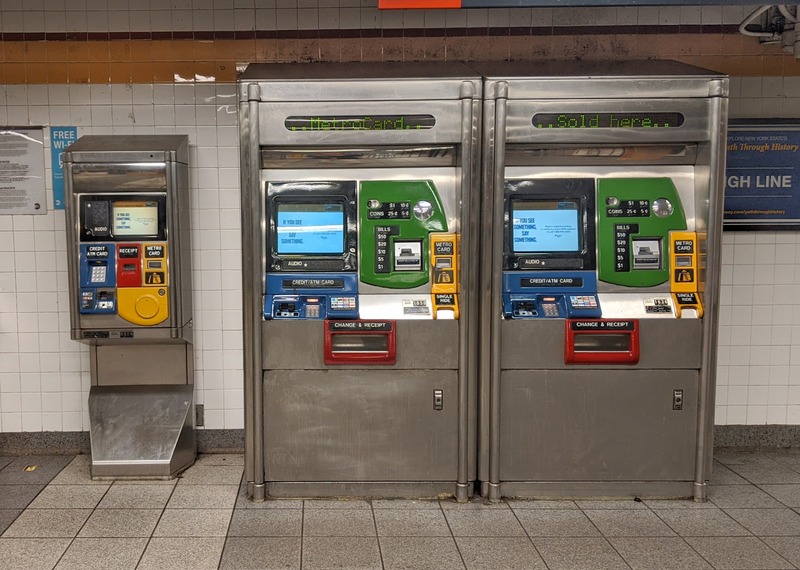 In fact, there is a (roughly) 18-minute delay at a given subway station between each swipe to prevent the card from being used by more than one person. 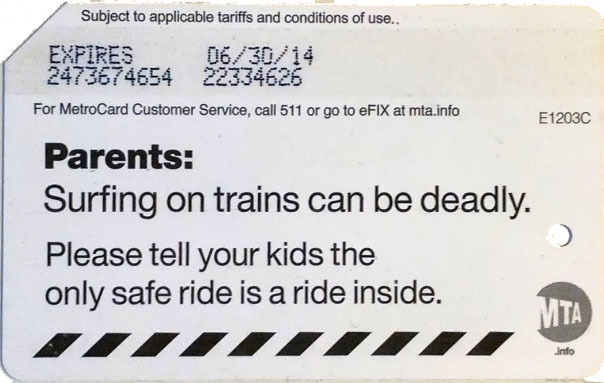 As noted before, on the back of every MetroCard you'll find a printed physical expiration date. 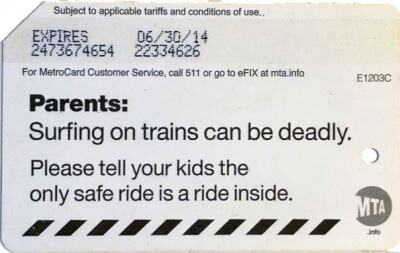 Do not confuse the printed physical card expiration date with the paid expiration of the Unlimited Ride time window. A card can carry "time ", "value", or both. In other words, you can add a dollar value to an Unlimited Ride card or buy time to an existing Pay-Per-Ride card. When this happens, the time card always takes precedence when you swipe it at a turnstile (it will activate the time window as necessary). After the time portion of the card has expired, it will then (and only then) start draining the value of your card. Lastly, MetroCards can be refilled. Provided that the physical expiration date on the back of the card has not passed, you can reload a new Unlimited Ride time window or just money onto an expired or empty card. While each subway station is guaranteed to have these machines, not every entrance to a subway station gives you access to them. 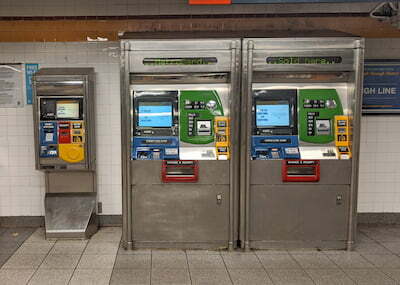 If you enter the station but do not see these machines, simply go out and find another nearby entrance to the same station. Remember that in addition to the price listed above, you must add $1 for the card itself. 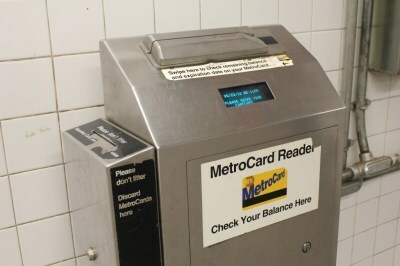 Notice that the small MetroCard vending machines do not accept cash. When you pay with cash on the large machines, note they can only return up to $9 in cash (paid out in $1 coins). When you pay by ATM or credit card, the machine will ask you for the ZIP code associated with your account. If you come from outside the United States, just enter 00000 as your ZIP code. In the above example, I have a 7-day unlimited time window and as well as $33.40 on my card. You might be confused by the first line displaying "TIME EXPIRED", but that's just because I used to have a previous unlimited time window on the card that has already expired. The recently-purchased 7-day window has not activated yet. To make matters worse, these readers also display on the last line the (mostly useless) physical expiration time (which is printed on the back of the card anyways). Again, don't confuse that date with any of the unlimited time windows. The keyword to look for is "THRU" to determine that the time window is currently active until the specified date (of 06/15/16 in the above example). Note that even though the reader only displays the expiration date, it is implied that the time window expires exactly at 11:59pm on that date. Because the display does not display "THRU <date>", it means that the 7-day unlimited time window has expired. The display also shows "INSUFFICIENT FARE" because the available $0.40 I also have on the card would not be sufficient to pay for a single swipe anyways.